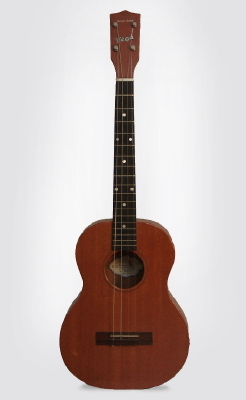 Vega Arthur Godfrey Model Baritone Ukulele, c. 1951, made in Boston, Mass., natural lacquer finish, original tan soft shell case. Overall length is 28 3/4 in. (73 cm. ), 10 in. (25.4 cm.) wide at lower bout, and 3 1/16 in. (7.8 cm.) in depth at side, taken at the end block. Scale length is 19 in. (483 mm.). Width of nut is 1 5/16 in. (33 mm.). One long repaired top crack below the soundhole; no other noticeable repairs. Minor dings and dents to finish. For some reason lost to history the name "Arthur Godfrey' has been excised from both the label and the headstock decal! Nice, mellow tone and a fine little player. Generally Excellent Condition.